Offering you a complete choice of products which include konark sun temple holiday packages, konark sun temple odisha holiday package and puri odisha holiday packages. Early breakfast at the hotel, then leave for a full day excursion to visit the ancient stepwell of PATAN, the quaint british style houses of SIDDHPUR, and the Sun Temple of MODHERA. Lunch in a local restaurant. Return to Ahmedabad in the evening. Dinner and overnight at the hotel. 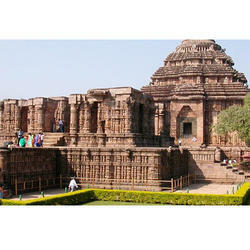 The magnificent Sun Temple at Konark is the culmination of Odishan temple architecture, and one of the most stunning monuments of religious architecture in the world. The poet Rabindranath Tagore said of Konark that 'here the language of stone surpasses the language of man', and it is true that the experience of Konark is impossible to translate into words.The massive structure, now in ruins, sits in solitary splendour surrounded by drifting sand. Today it is located two kilometers from the sea, but originally the ocean came almost up to its base. Until fairly recent times, in fact, the temple was close enough to the shore to be used as a navigational point by European sailors, who referred to it as the 'Black Pagoda'.The temple which is a chronicle in stone of the religious, military, social, and domestic aspects of the thirteenth century royal world. Every inch of the remaining portions of the temple is covered with sculptures of an unsurpassed beauty and grace, in tableaux and freestanding pieces ranging from the monumental to the miniature. Thousands of images include deities, celestial and human musicians, dancers, lovers, and myriad scenes of courtly life, ranging from hunts and military battles to the pleasures of courtly relaxation. These are interspersed with birds, animals (close to two thousand charming and lively elephants march around the base of the main temple alone), mythological creatures, and a wealth of intricate botanical and geometrical decorative designs. 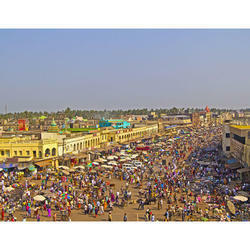 The abode of Lord Jagannath,Puri is one of the four celebrated religious centers of India.The Temple of Lord Jagannath built during the 12th century A.D. by Chodaganga Deva dominates the landscape for kilometers around. 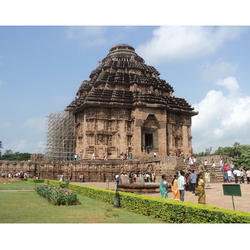 Being the tallest temple (65 metres) in Odisha, it is one of the most magnificent pieces of monuments of India. At the main entrance stands a 16 sided monolithic pillar (11 metres high), called Aruna Stambha which formally stood in front of the Sun Temple and was brought to Puri during the 18th century A.D. Some of the other important temples are Gundicha, Lokanath, Sunaragauranga, Daria Mahabir and Tota Gopinatt. There are also a number of holy tanks like Narendra, Markandeya, Sweta Ganga and Indradyumna. There are also many Monasteries locally known as Mathas.